For a limited time only, files for installing MS-DOS 6.22 and Windows 3.1! The version of Windows in this tarball is 3.1 -- not Windows for Workgroups 3.11 (for that, download it separately from my MS-DOS page). I got ahold of this version of Windows 3.1 from a CD image instead of floppies, so I had to convert them to floppy images myself, and not all the files fit on all the disks (there should only be 6 disk images but there's 7 in this tarball). Windows 3.1 can still be installed from these images, it will just require more disk juggling. When you get a "Can't read file" error, you'll usually swap in the next numbered disk and hit enter. Sometimes you'll have to go to the previous disk instead. If you want to download the components separately (DOS, Windows for Workgroups 3.11 and the drivers) you can find individual links on my MS-DOS page. Find a video driver that supports more than 16 colors (more info here). I'm no longer hosting the bundled tarball that contains all the files + a VirtualBox preinstalled disk image to clean up disk space on my server. Instead, download all the components and install it yourself. The Legacy PC Project -- guides for installing MS-DOS and Windows for Workgroups on old PCs. There are 187 comments on this page. Add yours. Kirsle this a great download brother, I been looking for this a long time and I finally found it on your page, I try it on virtual box and it work perfect, it remind me the good old days. dose it inc all of the floppys? is there a zip file instead of a tar.gz? Download WinRAR, it can open tar.gz (I thought the latest WinZip would too though but not sure about that). is for windows or linux? Why would anyone want to go back to the so called good old days. Windows is much better now than it ever has been. tank u i from iram ! Posted on Saturday, Sep 03 2011 @ 12:37 AM by Anonymous Why would anyone want to go back to the so called good old days. Windows is much better now than it ever has been. I can offer my 2 reasons - Need (I have an old 3.1 Image Editor that I love (ProImage Plus) which has worked throughout the years until 64bit, now its dead - I hope this will let me keep on using it :) and 2 - A Trip Down Memory Lane. Thanks for downloading, Kirsle. My first setup floppy is unreadable and I need a dos vm for a legacy app... thanks again. I am having a personal "nerd Fest" right now. Thanks for the files. You saved the day! Awesome!!! I don't need to take out the dust of my old floppy drive!!! Thanks! This works well when you need to bypass the windows 98 upgrades disc setup programs request to verify your right to use it. And by the way, cool website. did you buy this from a hosting site or did you set up your own server rack at home? Okay, so the install of Windows 3.1 and MS-DOS 6.22 in a VM on QEMU went without any problems, except for one peculiar problem: WQGHLT does what it needs to do (frees CPU cycles), but DOSIDLE does not. Also, when putting it in my AUTOEXEC, the whole system either freezes on startup (more common), or it gives a 'divide error' (or similar), keeping one of my cores at 100%. The effect is particularly noticeable when going into Windows 3.1, equipped with WQGHLT, from the command prompt, and seeing the usage in Task Manager on the host system go down significantly. I haven't tested running this in QEMU, only VirtualBox. If you just run DOSIDLE.EXE by itself does it help? If so, the autoexec might just be wrong. @Kirsle All right, I changed the hard drive format from VHD to VMDK and the problem no longer exists. Having a problem trying to put this on an old Dell Latitude. Doesn't matter if I'm trying to install Windows 3.1 or MS-DOS, if I try to boot from one of the floppies I get this message: Remove disks and other media. \ Press any key to restart. I'm fairly certain there isn't a problem with the floppy drive because I'm able to boot an MS-DOS startup disk I created with the Windows Explorer format tool (in Windows 7). I've tried booting this startup disk, then switched to an MS-DOS floppy, then ran SETUP from there but it then get a message: To install MS-DOS, insert Setup Disk 1 in drive A and press CTRL+ALT+DEL. This will restart your computer and begin the setup program. Is there something I need to do to make these floppies bootable or something before I copy the image over to them? Very good archive, Thanks a lot! @Kirsle The MS-DOS floppies don't work really well in VirtualBox 4.2.*. I've tried to insert the 2nd floppy when it requests for it, but it always freezes (even CTRL+ALT+DEL doesn't work) so I have to reset the VM. MS VPC 2007/Win VPC works a little bit better. That's weird. I just tested it in VirtualBox 4.2.0 and it managed to install DOS successfully (this is on a Fedora Linux host though). PROGMAN.EXE caused a General Protection Fault in XXXX:YYYY. used dos op system develment databas application.and next learn c , assemble ' language R&D other product . I am 60 years old . I really need Windows 3.1 for the sole purpose of using Paint. Without getting technical (coz I'd only confuse myself!!!) Paint on this version of windows was different from what it is today and that's the one I need!!). I've read comments etc on here, but I really haven't got a clue about computers. Please could someone be kind enough to explain to me how I could install this version of Windows on my PC, or maybe I could install it on another old PC I could get my hands to avoid losing data on my lovely new PC. I would very much appreciate it so m if someone could please tell me step by step how I can install this using the links on this web page? Can i get these three and resave them on my disk or there an easier way here? Whoa! THese are great! Thanks so much. I have never been allowed to properly install windows from scratch (well, I did do a reinstall of XP but that's different) but now I can expirence what it was like to install from DOS from scratch, thanks thanks so so sos sooooooo MUCH! Maybe you are just to stupid to understand. Hey, do you know if I would be able to run this version of windows off of a USB on a modern (2009) laptop that I took the C: drive out of? Thanks! Great to have these images - I have the floppies, but no floppy drive. Funny they're still called floppies when real floppies disappeared long before these came out. Floppies were the real deal when tape drives cost thousands. Sic transit omnia. Thanks a lot for these files!! I get these weird 'Library file damaged' errors when I try to use certain aspects of windows or open certain programs. Any ideas what is causing this?? Thanks for the files cutie. Thanks bro! A trip back to the past! i had Need For Speed 3 (retro) it was awesome helpful to me. now i can play that brilliant game. thanks so much. I know this is a late comment but thanks for the Win3.1, I have a problem trying to get 256 colors I have a NVIDIA GeForce 7500 LE chip set board and wondering if I can use the old window3.1 display drivers? If you're installing Win3.1 in a virtual machine, it doesn't matter what your real life video card is, the virtual machine sees the fake video card that VirtualBox shows it (i.e. Win3.1 would have no way of knowing you have an NVIDIA card even if it wanted to check. It just sees a standard VGA compatible card that VirtualBox presents to it). Thanks for that Kirsle, I have 386grabber file called SVGA256.3GR and a driver SVGA256.DRV on my harddisk. For 256 colors do I just edit the system.ini / system.inf files to get the video drv installed? I have P1 system and have installed windows 3.11 work group with DOS 6.22 after some time (few hours) of running system indicate that "operating system not found" and system stop. Can any one tell what would be the problem of having this message and what can we do to resolve the same. Thank Thanks and Thanks again. The only problem I have is it keep telling to insert the disk labeled MS-DOS 5.0 disk 1 and I thought I had but it still says it. Any answers to that. Jesus Christ! Thank you to Jesus Christ!! You are a true computer warrior!!! My immensely powerful 4MiB RAM (1992?) Sanyo has a new lease of life. "Why would anyone want to go back to the so called good old days. Windows is much better now than it ever has been. "?!?!?! Sir, I believe you are in the wrong place... That's like asking why anyone would ever want to own a NES anymore because the newer systems are so much 'better'... There are plenty of reasons for installing a legacy OS such as DOS (CMD is NOT DOS) and Win 3.11. @Kirsle Thank you very much for keeping this corner of the [Internet] universe going. Kirsle Hey, I did not know you could tell me a program to format floppys. Dos to me that does not fit on a floppy disk. Thank you. I want to try upgrading from Windows 1.0 to Windows 8 in VMware Workstation. Looks like a great site. Too bad I don't have an O/S on my old HDisks. So what's the easiest method to transfer files two and from the VM, do you have to make a floppy image of anything you want to copy than mount it? Hi, hy host is Ubuntu, and I'm running dos and win 3.1 from the vdi file just fine, but I cant seem to make the shared folder thing to work. I setup the shared folder in virtualbox settings, but when I try net use x: \vboxsrv\sharedfoldername it says "bad command or file name", so net is not installed .. Do you know any workaround for sharing files beterrn host and guest in this case? If the networking works, try an FTP server you can connect to from within the virtual machine. Create a floppy disk image you attach to the VM to copy files to/from, then detach it from the VM and mount it as a loopback device on the host OS to access files. For a host-to-guest only transfer, create an ISO image (some CD burners on Linux let you turn a folder into an ISO file instead of burning to disk; you'd select your folder, right-click "burn to disk" and on the burn:/// URI the button to actually burn would pop up a window where one option is to make an ISO instead. Power off the DOS VM, and attach its hard disk as a secondary drive on a newer VM (i.e. Windows XP or Linux) which does support guest additions. Note that two VMs can not be powered on at the same time if they have the same disk attached! Many many thanks Kirsle for your work. Installed Win 3.1 on DOSBOX with no problem. I have downloaded some of the MS Entertainment Packages with games like Skiing and Rodent Revenge - I am however receiving erros when attempting to run the game EXE's --- "Make sure.... that all libraries are are available". Could you offer some expert assistance? Great page, glad to see such a current maintained website in relation to MS-DOS, and as I can see from the navigation menu on the left, much more. Needed pure MS-DOS disk images to teach a strong foundation in using computers in general, and to build from there into current technologies while showing ties and connections to the legendary MS-DOS along the way, once again, glad I found this site. I will be coming by often. Thank you! thanks but do u have it in a single iso? MS-DOS and Windows 3.1 were originally distributed as floppy disks, so no CD-based installation is supported. On this page I have an "unpacked" Windows 3.11 install folder (it's a single zip file that contains all files from all Win3.11 floppy disks). You could turn that into an ISO file using any ISO creation tool. It will not be directly bootable, however. Install MS-DOS from floppy disk images (no CD/ISO based install is supported for MS-DOS). Or if you have a DOS boot floppy that has CD-ROM drivers built in, boot that and then mount an ISO containing all the unpacked MS-DOS floppy files. But basically, a floppy disk boot is going to be used one way or another. Install a CD-ROM driver into MS-DOS so that you can mount a CD as D:\ for example. Install Win3.11 from there, rather than the floppy on A:\. The installation would happen more or less the same way except it won't ask you to insert the next floppy disk, as all the files it needs are already present on D:\. Hi, This is really great. I have been looking for windows 3.11 for a while. Just to remember how far the computer world has come in a very short time. Its good you got it here for download. I will try it out. You are great! Thank You very much your work. I read a post asking why would anyone want to run this old OS. (I go back to 3.20) I run 6.22 because of a radio BBS system I helped develop back in the 80's. I still have it running on a old Dell Optiplex (slim line). I know its going to die one of these days, so this site has put the bug in me to get on a newer machine.. I also run a similar vintage Optiplex tower with Win98, using it as a file storage machine. These rigs are over 25 years old, so am treading on thin ice; especially since they run 24/7. So, I go from MSDOS to Server2008 plus Win7. The fun part of 6.22 is scripting for extra memory. The BBS takes a lot of extra RAM to function. Anyone remember the old game of Eliza? My old 8088/8086 machine is used for EPROM burning and Amtor. (not that I burn any PROM's any more) What's my favorite OS? Vista, hands down, but this old stuff is a kick to fool with. I purchased my first computer in late 1978. MS-DOS did not exist yet but TRSDOS is what I learned to use. During the 1980's I wrote a complete set of accounting programs while being an Accounting Manager. When IBM's PC came out I slowly switched to Windows 3.1 and MS-DOS and continues to write programs. Sure, the PCs today are better but not faster for the work I was doing. I recently fired up an old Windows 98 computer and my TRS-80 portable and both work very well. But I could not recoup an old IBM desktop running win 3.1 that had the two floppy sizes. I still have tons of 5-1/4 and 3-1/2 disks holding my old programs that worked very well during the 80's. Now I'm writing a similar set of programs that work with win 95 to win 8 and trying to get my previous stuff in text format. The win 98 has a 3-1/2 disk drive and an MS-DOS prompt that I can use but will come back here it I need to download win 3.1 I'm glad I found this site while it's still around. The TRS-80 model 4 uses only 2 5-1/4 disks and there is no way to get my stuff transferred out of those TRSDOS disks into something like a text file I can read with more recent windows computers... darn it. Firstly thank you for this webpage and your downloads. Attach a floppy drive controller to the VM (if you created it as a DOS VM, it should have one by default). And then mount the floppy .img file as a floppy disk rather than a CD or hard disk. Has nobody noticed that the Windows 3.1 floppies are messed up, or am I the only one? The MS-DOS floppies are fine, but three files on the Windows floppies are corrupt (Windows Setup brings up an "Unable to read file" error), and the files on the Windows floppies are arranged incorrectly across the disks. For example, Setup will ask for Disk 2, and you stick it in, and then later it will ask for Disk 2 again, at which point you actually need to stick in Disk 3, because for whatever reason some files that are supposed to be on Disk 2 are on Disk 3 instead. This happens across a couple other disks, too. Both of these issues happen in both Virtualbox and on a physical computer. In the blog post for this (these comments are shared between the blog and the /msdos page) I mentioned what the cause of this is. I got ahold of this version of Windows 3.1 from a CD image instead of floppies, so I had to convert them to floppy images myself, and not all the files fit on all the disks (there should only be 6 disk images but there's 7 in this tarball). I'll make a note of it on the /msdos page as well. I think it's really cool to get some the old 90's stuff running again on modern hardware. :D But so far I have no luck. :'( I've downloaded and installed the latest version VirtualBox on my Windows 7 x64 machine. Unfortunately it keeps crashing as soon as I start any virtual machine. I've also tried to create one from scratch. I get it to boot from the first MS-DOS 6.22 floppy image, but after a few seconds I get a memory error and it just aborts the VM. It seems like a terribly unstable product... :-( Do you have any suggestions for me? What are the specs on the Windows 7 machine? It should have enough RAM to allocate some to a virtual machine while still having >50% for the host OS. iirc MS-DOS VMs default to only needing some low amount of memory (like 128MB or something? DOS/Windows 3.1 wasn't a very memory hungry system by today's standards), you can probably just use the defaults. If your host OS has only 1GB of RAM altogether that could be an issue still, though. Hi Kirsle, Thanks for your reply. If my computer was 10 years old, there would be no need for a VM since a computer from that era should be perfectly capable to run Windows 3.11 as its primary OS... :-) Actually my computer is quite new (Intel Core i7 with 8 GB RAM). So that shouldn't be a problem. I've also tried this on another machine (Intel Xeon with 8 GB RAM) and the result is the same. VirtualBox just keeps crashing every time. :-( In the meantime I was able however to install Windows 3.11 using DosBox.... That worked like a charm. :D Of course you don't get a snapshot mechanism with DosBox, that why I would prefer a VM. If you like DOS and/or its software you can participate in a new international project. We are looking for 100 users and 10 developers (to start), from all over the world who want to use DOS and if we find them, it will be back (updated and free, of course). The new software for this OS will be available, too. If you are interested – contact us: dosrenewal@gmail.com and let us know that you want to use either DOS or its software so we could add you to the users list. In addition, we invite programmers interested in working on the DOS kernel, drivers and software. Poland. Jak zbudować pendrive USB z win.3.11 ? Musi dobrze pracować z plikami .dos i .exe Czy to budowa w HPusbFormatToll - SelfImage ? Proszę zbuduj live cd/usb z systemem win 3.11 o masie 1 gb ze wszystkimi ważnymi dla ciebie dzisiaj pluginami. Thanks kirsle Your The Best!! Ah! The good old days, the days before internet gotta love bbs simple modems logging into bulletin board systems searching for files like mod music and trackers even games like betrayal at krondor and the early Warcraft series those were the days now days you don't see real games on shelves anymore now you must use that crazy arse steam to pay play bugger that !!! You can keep your game I prefer the old way pay once not twice for software. Even Internet access prices are crazy too. Soon the net will only be for the rich!!! No matter the good old days were the best! How can I configure the config.sys and autoexec.bat to allow use of the DVD from DOS? I am getting "This is not a bootable disk. Please insert...". I've setup WFW311-1.img as the floppy in virtualbox. Any thoughts? Cheers, and thanks. Windows 3.1 was more of a graphical desktop shell than a full operating system. It runs as an application on DOS like any other. I was about to do that as a workaround :) cool, thanks. I have managed to get dos. working on vm5 and then I am able to go into the windows directory and type win and it works, thanks a lot. My main question is, I have a folder called games, how do I get to see it to play my games in there? You'd have to create a new group in Program Manager (or use an existing group) and manually add the game icons to it yourself. I have copied my games folder on to a cd, but I cannot change to the cd drive in dos, help! D:\ is usually the letter for the CD drive. You can start up Windows and use File Manager to see all the drive letters for sure. If your CD drive doesn't show up, make sure you installed the driver I included in the original post. Does this have COM1 (serial port) drivers with it? I can't run Internet Explorer 5 in Windows 3.1, do you know how to solve that problem? I want to know if there is any graphic card driver for virtualbox in windows 3.1? I've been told dosbox is supposedly easier to configure than virtualbox, which sun doesn't support. any feedback? I would probably be attempting it on a windows host, unless I get a spare computer besides my business systems. To the ie5 question; ie5 won't run in windows 3.1x , I would try windows 98se or a "light" installation of win 9x. ie 5 is native to win2k. I think ie 3 might be the last for 16 bit win, I would try one of the old browsers of the time, like old netscape. For the people above that want win 3.x for a single 16 bit app; many apps, including many accessories bundled with win 3.10 and 3.11, will run by themselves inside a 32 bit windows xp installation. (some may in a 32 bit windows 7 box as well, I haven't tried as many there. Starting with win8 ms dropped a lot of backward compatibility.) I don't remember if cardfile was one of those, but I would try copying that, old paint, and other accessories you need to a more modern installation. 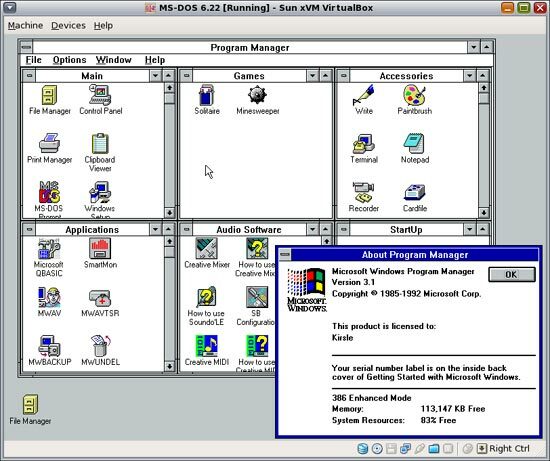 Of course, there were many 16 bit programs that would not run on a 32 bit windows, but you won't need a virtual box all the time for many apps. Looking to revive an old Dell 3000 laptop but need the full disk set 3.1 OS. Ultimately the plan is to go to 98SE but I'm going with the Upgrades 95 and 98 after 3.1 is installed only because I have those handy. Downloaded your Tarball file and Winzip 20 trial but just don't have a clue HOW to put those files to floppy disk. Never really got too into using a zip extractor at all since the beginning of the PC. QUESTION: Can I actually accomplish this with your file or do I need a stand alone disk set. Really could use your thoughts on this. Not being nostalgic but have a use for this laptop. Is it possible to get MIDI sound under VirtualBox? 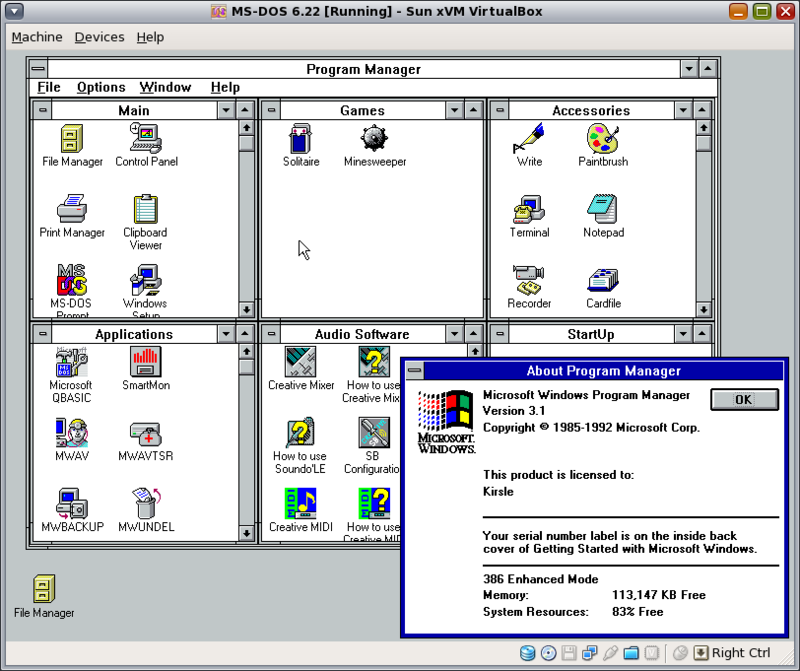 I succeeded to install Windows 3.1 in VirtualBox 5.0.16 using provided VDI file. Why can't I run Calculator (calc.exe)? It shows error "Application Execution Error" with message "One of the library files needed to run this application is damaged. Please reinstall the application." I Found an old but unknown DOS !!! OSx16 Operating System (MS-DOS Compatible) BOOT-CD Image And BOOT-USB Image Files ! I Found OSx16 Operating System Image Files In : https://goo.gl/8WtKXn And I Found Many links to OSx16 Operating System in some forums !!! OSx16 Operating System Image Files Includes Nice Collection of Atari 2600 Games And DOS Games and NES, SEGA , ... . I Found that OSx16 Supports USB sound cards !!! OSx16 Operating System Really Works With My USB sound card !!! (I Have HQ Sound with Atari Games And Some DOS Games !!!) (Ideal For PC(s)/Laptop(s) Systems, Without HDD, SOund Card !!!) Why Somethings Are So Unknown and Are in Shadow ??? It Seems OSx16 is Closed source and Sahred As Free and As shareware !! There is a game, in CD and USB (Bootable image files) , that Only executable under MS-DOS, PC-DOS, only. Executing under Other MS-DOS Compatible !!!! Like the FreeDOS was Impossible !!! What is OSx16 Operating System ????? Do You Know Anything About OSx16 Operating System ? This is a very useful site, I had installed DOS on an old 386 and Penll, both have crashed and now been recycled. I still have my floppy's for First Choice that i have been attempting to install into my xp, but of course i am having problems. I am using a external floppy drove/ Amy advise? Windows 3.1 System operation 19? Format .iso? disk image 1 for windows 3.11 is not bootable in wm ware!! I am an engineer and have an instrument which connected to a computer. I want to install me-dos 6.22 and don't have installation disks. Can you briefly tell me how to install it on the hard disk. Google and/or bing and/or ... For MS-DOS Boot CD and Download it (burn the boot CD with burner). Boot System With MS-DOS Boot CD. Type : CD \DOS Run FDISK and Create Partition/Partitions In Hard Disk. (and Reboot) Type And Execute "C:\DOS\Format d: /s" command. (After Boot by Boot CD, Drive C is CD-ROM and Drive C of HDD Would be D) Copy DOS Directory(Folder) to c: (Just is D:) in Two steps : MD D:\DOS COPY C:\DOS\????????.??? D:\DOS\????????.??? Remove CD From CD-ROM Drive And Restart System. How do I get 256 colors? ""Posted on Friday, September 30 2016 @ 07:23:01 PM by Johan. How do I get 256 colors?"" Windows 3.1x Family Setup/Installation Disks Includes Standard Devices Drivers. Some Of those drivers supports standard (and OLD) VGA/SVGA Graphic Cards. Like Other Windows Family Operating System, Goto ->Main->Control Panel and Change Video/Display Setting(s). You need Win 3.1x disks (Usually). Yeah, I tried selecting one of the 256 color options and it was configured succesfully, but when I rebooted the colors were all jumbled up. It was a mess. I successfully installed cd drivers before, but when I try to do it again now, it says "No drives found, aborting installation" and lower down "Device driver not found: 'MSCD000' . No valid CDROM device drivers selected"
OK, so I fixed both the display driver issue and the CD driver issue, but now, when I have finally installed the game I'm doing all this for, I get a prompt that says "System Error Cannot read from drive D. Cancel Retry" when I try to run the game. I can read the CD just fine in the Win file manager, as I managed to successfully install the game. Any ideas? So I managed to fix reading problem by copying to hard drive and reading from there... but now, when I try to install Soundblaster 16 drivers, it says "Not enough conventional memory is available" and exits. Listing The Contents of The CD By File Manager, is not enough. Ensure That The Contents of The CD Are Fully Readable. To Do, Copy All Directories/Sub-Directories and Files To Local Hard Disk Drive (Even, You May Able To Install Apps and Games From HDD !). At the end, You Will Find The Source of Problem(s). Yeah, it all works now. Thanks for replying. Thank you for your efforts in helping to preserve old software and operating systems. These are very much appreciated. These are floppy disk images so you'll need a "floppy disk image writer"
If you're on Windows, WinImage is the software that comes up when I google this. # if = "input file", of = "output file"
# make sure you get them right! dd can also be used on macOS if you have a floppy drive but you'd have to find out the device name for it if it's not /dev/floppy. cool. now i can run win3.11 in my dosbox. thanks a lot! first i cleaned the harddrive. The problem i get is afther the installation. Then afther the boot Windows freez en Mouse and keyboard not working. Have to restart system then when start Windows with a switch option. Is there anybody that knows something about this problem? Hi Kirsle! I remember this back in 2012. I would like to thank you for providing this - you have made my old computer projects possible. You're awesome. P.S. Is this page still active? I hope it's not abandoned! If you respond, you will calm my nerves lol. Thank you!! Just wanted to say thank you for keeping this place up and running. It is a wonderful resource. @Kluunsoft: is there some how possible to get the "Then i have installed MS-DOS 6.22 and Windows 3.1 ( Compaq release )" i have compaq presario 425 but need to get os installed after disk crash and i dont have recovere floppys for it. I just wanted to let everyone know I was able to get VERY GOOD quality MIDI going on a Windows 3.1 Virtualbox installation using Yamaha's S-YG20 Wavetable Synth. Literally spent 2 or 3 hours scouring the "internet archive" until I found a single location where the Windows 3.1 version was included a part of a bigger package of stuff. Only problem is that it is a "trial" version and expires after 90 days or December 1997 (LOL) so you have to set Virtualbox to disable syncing of the system calendar/clock with the host, and then set the guest calendar to like Jan of 1997. The file you want is called Yamaha S-YG20 version 1.091 t3. Its included in a larger self extracting .EXE that is supposed to be a plug-in for Netscape. (One interesting point: The MIDI here is 1000% times better than anything that comes with any version of Windows from VISTA onward. Sad to see MIDI fading away). @claude may have had this question, too. Q: Why are there 3 images in the DOS 622 zip ? A: This version came on three diskettes, and included a setup program that can install it on a hard drive. During the install, it prompts you to insert the next diskette(s). In Virtualbox, this is done by selecting the next image using the Storage setting. BTW, you can boot from disk 1, exit setup, and have an A> prompt, no hard drive or extra disks required. @Kirsle -- this is awesome. I was looking at having to find where my diskettes are, find a good one, and a working drive. Thanks! I have an old but still running DOS PC with WIN 3.1 --- my question is how can I determine which version of DOS in installed on this PC? Thanks, That worked great! Now I know I have DOS 5.0 installed. Did not know the "ver" command would work on a PC as old as mine. Thanks again. Эффективно! Много лет не видел Windows 3.1/1/. Если MS DOS ver. 0.00, то больше нравится 5.00 Авторы web-сайта помогли психику поправить. Hey, I don't see the windows 3.1 files, only the Windows for Workgroups 3.11 ones. Where can I find them? sorry, i cannot find these files.could anyone help me? l am interested in many old pc systems and l am looking for them. l want to use them again and recall my memories. if you are looking for SVGA graphic card drivers I will be happy to provide them. 1024x768 is much much better than oridinary 800x600. Thanks, win 3.11 up and running on an Umidigi F1, living like the 90's again.